If you are trying to pare back your budget in the food category this year there are ways to save money eating out that can drastically change what you spend every month. Some personal finance gurus might suggest avoiding it altogether. And that might be wise in some cases. However, I consider checking out my local eateries more of an experience than an excuse not to cook. So if you’ve got the urge to hit the town for a meal every once in a while, or if you’re just a mess in the kitchen, here are 7 tips to help you reduce your costs and to gain some more control over an area of your finances that can easily spiral out of control. Eat out on weekdays. If you decide to eat out on a weekday instead of a weekend you’ll almost certainly save money. The key is finding out which local restaurants offer the best weekday discounts. For instance, a couple of seafood places in my neck of the woods offer a dozen oysters for $5 on Tuesdays. My local Irish pub offers $5 burger and fries on Wednesdays. These types of specials are pretty much only offered on weeknights – so start finding out what deals are going down at your local spots! Another perk is avoiding those crazy Friday night crowds. I hate waiting for a table! Sign up for restaurant emails. My favorite local eatery (it’s a mildly fancy one) sends out monthly e-mails with updates about what’s happening. At the bottom of every email they place a gorgeous little coupon. It can save us 50% of our entrees if we will arrive early…on a weekday. That makes it not the easiest deal to use, but because the discount is so awesome we find a way to make it happen. Maybe I’m too cheap, but I don’t go to this restaurant now unless we’re using the early bird special coupon. This restaurant also offers a sweet deal on gift cards around the Holidays. If you spend $100 you get a free $50 gift card. That can make a great gift or just add to your sweet discount all year long. Sign up for e-mails with your favorite local establishments. Maybe you’ll get some sweet offers because of it! Share an entree. The portion sizes at most restaurants are insanely large! Most of us really don’t need that much food. Consider sharing a meal with your dinner partner instead and halving the check. There’s one particular place that my wife and I always split the entree. We need to be better about finding more places to do it. It really does make that final bill much more manageable. 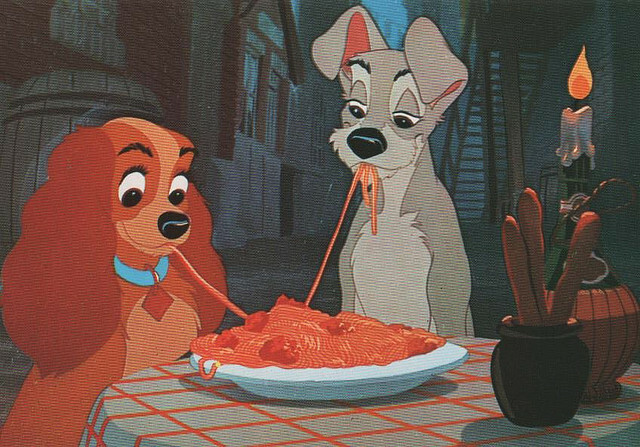 Plus, if it’s spaghetti you’ve got a possible lady and the tramp moment waiting to happen! Don’t order dessert. The end of meal delicacy is a wallet slayer. Desserts often have a higher profit margin than the main course. And honestly, who needs ‘em? Staying away from that dessert page in the restaurant menu will save you money and the unnecessary calories. It’s much cheaper to have some popcorn or a bit of ice cream at home anyway. Plan ahead. Thinking about your upcoming week and what you’ll do for sustenance ahead of time can save you big money. I know that some of my most costly food months are the ones in which I didn’t spend very much time planning my meals. Writing down your meal schedule can help you avoid a costly last-minute trip to your favorite restaurant. If you wait until you get home to see what you have on hand chances are you’ll take the easy (and expensive) way out far more than you envisioned you would. Go out for lunch instead! If you can’t hit up any of those early bird specials during the week or if eating out Monday through Thursday is just too difficult in your household, know that lunch on a Saturday or Sunday could also save you some real money. There’s one seafood place in my city that I’ve been dying to try. But it’s ridiculously freaking expensive! I’ve looked at their website though and they’ve got some really decent lunch prices. When I do make it there (hopefully soon) I’ll definitely be enjoying a long lunch with my wife. And I won’t feel bad about it because I’ll be eating amazing food at much lower prices just because I changed the timing of my visit. Use a gift card. I’ve told you about how I shop for clothes. I love to pre-purchase a hugely discounted gift card at Cardpool.com before I even step foot in the store (or their online presence). You can do the same thing with certain chain restaurants. You can save 10-15% right off the top just by using this strategy. If you pair it with some of the discounts above you’re talking about big possible savings. This was a legit family experience! There are certainly other tips that will save you money when eating out. Drinking water and staying away from beer and liquor will certainly make asking for the check less scary. I’m such a craft beer fanatic though that a dry hopped IPA or a smooth Scotch Ale are usually something I’m willing to pony up for when I go out for some grub. Remember, going out to a cool restaurant and taking the night off from cooking can be worth it. It can be more than just choosing to spend more money on food that evening. I enjoy dining out for the experience. I’m not sure of the exact reason but my wife and I often have our best conversations when dining out together. Maybe it’s just the fact that we are able to slow down and be more cognizant of each other. I hope these are some helpful tips and that they make your next trip to the restaurant a little less financially frightening. 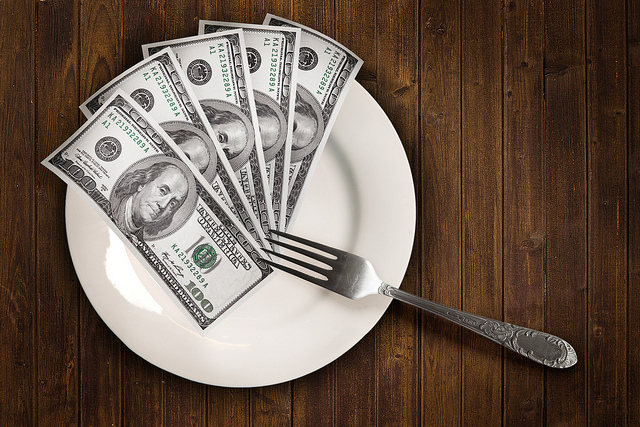 What are your favorite ways to save money eating out? Another strategy is to just go out for dessert. Make dinner together at home then go out later in the evening for something sweet. You’ll split it so it’s cheaper yet it still gets you out of the house. I love it! Great tip Leslie. Me and my hubby have done this several times. It’s a great way to still get in great conversation and relaxation with a much slimmer price tag! A couple strategies the wife and I employ are to split an entree and drink water. The food portions have gotten so large, most entrees at most restaurants is plenty of food for two people. With regards to drinking water instead of soda, the (watered down) soda is crazy expensive and water is so much better for you anyway. Keep splitting those entrees buddy! I love checking Groupon & LivingSocial first, especially when the whole idea is just to explore somewhere new. It’s even better if you can pile a gift card (or a discounted one from somewhere like Raise.com) on top of it. No doubt Mel. Thanks for your thoughts! I do love the discount gift card websites a lot. Yay for ScoutMob! I fricken love that app. It’s a bummer that it’s limited to certain major cities — but I guess that also makes sense. I’m a big fan of the “only eat half” school of thought. Usually portions are huge and if a meal is $15 but I can save half for a second meal it makes me feel like I’m spending less money. But, it’s only effective if you aren’t a huge man who needs all that delicious food in one portion. Definitely. Leftovers rock! That’s another meal you don’t have to cook. This is a great list! My hubby and I always split an entree which is not only good for your bank account but good for your waistline. We also look out for happy hours or special days/times when restaurants we like have deals. Which reminds me, when I was last in Atlanta, I went to Oceanaire which had AWESOME happy hour deals on food and drinks. You are so fancy! I’ll have to check that place out. Sharing a meal is no joke! My wife and I share the fajitas all the time at our favorite Mexican restaurant. Americans love themselves a big ol’ meal so why not take advantage and split them. I’ll have to check out scoutmob. I’ve used restaurant.com gift certificates which are similar to groupon. It saves a good amount when eating out. I rarely drink anything but water…it’s such a rip off. And water is so much healthier anyway. How old is your baby? 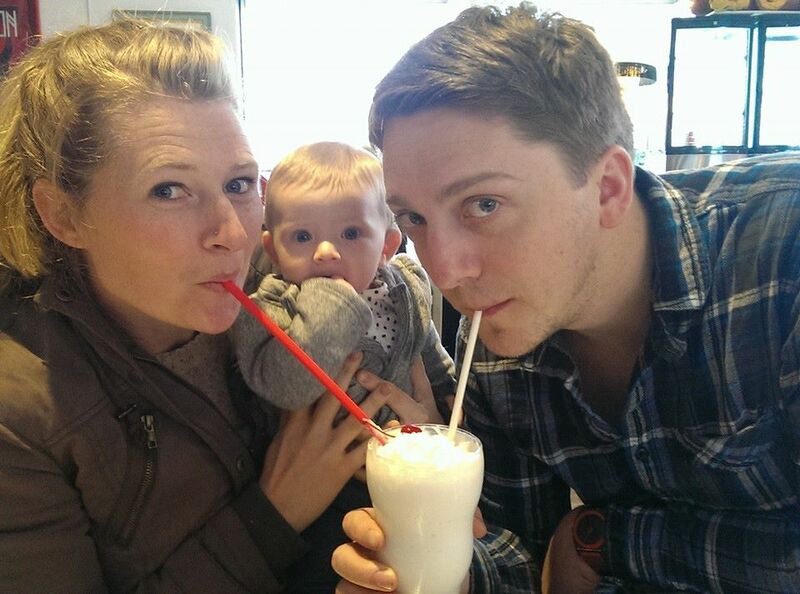 We haven’t dined out much with our 7 month old…he’s okay during the day for the most part. But once we get past 6 or 7pm, going out to eat is out of the question. I’ve got a 7 month old girl! So I totally understand. But we trade off date nights with some friends who have a little girl the same age. So on those nights we can stay out a bit later. Great ideas! I love saving money so I can eat out more so I try to go for lunch or on off hours and always order water. That’s my goal too. If I go out to eat and don’t spend an awful lot then I can go again sooner! We have two young boys so we always look for places where the kids meals are free. We also use Groupon and Travelzoo quite a bit. So which restaurant is your favorite local eatery (the mildly fancy one)? Free kids meals. That’s smart! Agave. You heard of it? Ridiculously tasty. And the wait staff is fantastic. It sounds familiar but we’ve never been there. We’ll have to check out on one of our upcoming date nights. You definitely should. But don’t forget to sign up for their emails first! Yep, already did! How often do they send out coupons and discounts? If you don’t want to share, Ask for a doggy bag/to-go box. I’ve found restaurant leftovers or (just buying a small amount of prepared dish from a buffet) great to use for a short cut when making food at home as well. Typically I ask for grilled mushrooms/veggies/rice instead of fries to eat, then chop off a few bites of whatever meat I got to toss on a salad at lunch the next day, or into a small casserole. Also if the restaurant has a deal that includes dessert you can typically ask for the dessert to go. Remember to tip a bit more generously when save $ out, because the waiter is still serving two, keeping glasses full, and/or try to base it off of how much you would be buying (if you have a % off deal). Plus if you are regulars, the server may begin to help point out new deals if it doesn’t cut into their pocket. Good tips Sara. Thanks for your thoughts. And definitely, tip accordingly. I like your idea of splitting an entree with your spouse, but some restaurants impose a split charge fee. To circumvent that, have each person order an entree and save half for lunch the next day to get two meals out of it. Now how in the world did I forget to include that tip?! Thanks for adding that to the conversation T Boz! We thought about going to a place that offers free kids meals during the week but we are better off ordering and picking it up. There’s no pop charge and there’s no tipping. We ALWAYS split entrees, never order desert, keep it to one drink, and don’t waste money on fluff. We can usually get out for less than $50, and do this once a month at the moment. We also seem to stock up on gift cards during the holidays, and get groupons at INSANELY good prices, so eating out is no a budget busting affair. I am sure this is the second article I have read recently along the same lines. I must love saving money. The truth is that I love going out and hate to pay extortionate prices for restaurants. For example, if you paid $100 for a Saturday night restaurant outing you could actually eat out about 3 – 4 times with that money with your suggestions. We work from home and our children have left home. So, we have the luxury of eating whenever we want. You cannot believe how cheap the same food gets during lunch time. We can eat in our favorite restaurants for half the price if we decide to do lunch instead of dinner. Friday and Saturday nights are busy in town and you wouldn’t get enough attention from waiting staff anyway. We use those days to try cheaper food outlets. For example, we don’t mind getting food from a carry out vendor, park our car next to a park and eat in our car. Try it, quite intimate. Another problem with Saturday nights for us is that we like to do something like going to a movie or a theater. Generally the performance schedules doesn’t really match well with eating. Either you eat later and starve through the performance or eat earlier when restaurants empty and there is no mood. We sometimes go to movies at those theaters that also serve food like Studio Movie Grill, http://www.studiomoviegrill.com, so that’s a good option if you have one near you. The food isn’t that bad either, it’s better than I thought it would be. Also, I forgot to mention that Groupon periodically has deals for tickets to Studio Movie Grill for $6 a ticket, http://www.groupon.com/biz/alpharetta-ga/studio-movie-grill. What we usually do to save money eating out is to just have lunch/dinner at home since most of the foods from the restaurant are pricey. We just have dessert and drinks outside.